Marking Methods - Numberall Stamp & Tool Co., Inc.
Metal marking is a process used to create permanent identification marks, such as serial numbers, date codes, or product codes. These marks are created by using a marking device with characters or symbols to indent metal. Numberall manufactures the equipment that is used for this process. One of the simplest pieces of marking equipment is the hand stamp. A hand stamp is a rectangular piece of metal with a character engraved on one end. To create an indent of a character in an object, the character end is held against the product you wish to mark while you strike the opposite end with a hammer. The same concept holds true for our more complex equipment, but instead, a press is used to create the force necessary for indenting. In addition, some of our more complex equipment can automatically advance the numbers, to create consecutive serial numbers. There are other methods, besides indenting, available to create identification marks. Hot Stamping essentially “brands” a product using a heated marking device to indent the material. 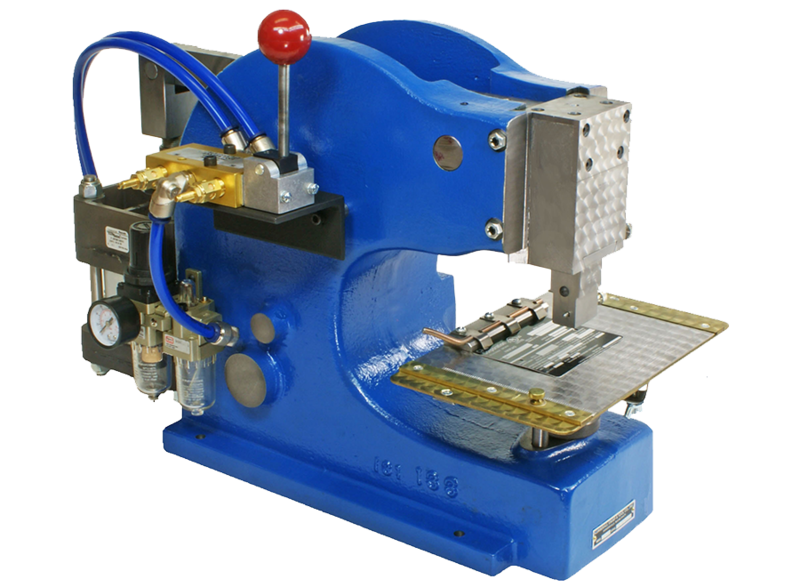 Numberall produces a vast selection of marking equipment intended for hot stamping. To add color or decoration, a Hot Stamp Press with foil can be used. Laser marking uses a laser beam to create a shallow character in the part. The advantage to this method is that there is no stress on the part and nearly any kind of font or graphic can be created. However, the entire system must be enclosed to protect users from the laser beam and there is a high cost associated with laser marking. Inkjet marking utilizes a printer that sprays a stream of ink in the shape of a character on the product. It is very fast but also very messy and is not permanent. Dot Marking is a micro-percussion marking technology. It uses a vibrating single-point tool that indents a series of dots to create characters on metal, wood, or plastic. Chemical etching is practical for creating the same mark every time by using a caustic acid and silk screen to burn away a shallow mark on the part. However, the screen will eventually wear out and require replacement. In addition, extreme care must be taken when handling the acid, as it is very caustic. *All trademarks or product names mentioned herein are the property of their respective owners.